' ' Features: ---Compact and Powerful Mini Amp System ---Built-in Bluetooth for Wireless Audio Streaming ---Compatible with All Your Favorite Bluetooth Devices ---(Works with iPhone, Android, Smartphone, iPad, Tablet, PC, etc.) ---SD Memory Card & USB Flash Drive Readers ---Digital LCD Display Panel with Touch Button Controls ---USB Charge Port for Device Charging ---RCA Audio Input (L/R) ---AUX (3.5mm) Input Connector Jack ---(Connect Devices like Smartphones, Tablets, MP3 Players, etc. The ART DJ Pre II should be in every DJ's gig box! Vinyl records have drawbacks. Bass compensation can be needed during playback. A separate RIAA preamp is necessary when you are connecting a turntable to a mixer that does not have one built in. Its in like-new condition. Check out the Schiit website for details on the item. All-in-one amplifier with SD/MMC card and USB input. Up to four speakers can be powered using the dual stereo output. We will not begin processing your order until the funds have cleared. Each speaker order includes the following instructions: To "audition" a speaker without scratching or marking it will require getting into the speaker cabinet and listening to it play without actually mounting it with screws. Type of power amplifier: AV power amplifier. 1 X amplifier. bluetooth：Press until the word "BLUE" is displayed on the screen. The recording output level: 1V. Distortion: ≤ 0.5%. FM：Press until the word "FM" is displayed on the screen. NEW MCINTOSH C28 PREAMP PREAMPLIFIER GLASS FACEPLATE FACE. This is a brand new glass from mcintosh. Will be shipping in original mcintosh glass box. A switchable low cut filter removes turntable rumble while leaving the audio pristine. 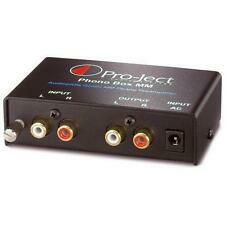 The built-in low noise phono preamp circuitry is highly accurate and precisely conforms to the RIAA standard. The line output jacks are low impedance and can be used with any sound card. I have a large collection of Carver amplifiers. Each one has unique characteristics. Bob Carver’s Powerhouse Receiver. 200W per channel @ 8ohms. Modified panel lighting to LED from incandescent. THREE Relays Replaced (Speaker and SH Circuit). *TESTED* Yamaha Natural Sound Stereo Control Amplifier Preamp CX-630. Condition is Used. TESTED* Yamaha Natural Sound Stereo Control Amplifier Preamp CX-630. This amplifier is in great shape, not much wear besides some light scuffs and scratches. I have tested the amp with a MX-800u amplifier(also available for sale) with all inputs including phono and everything works. The SPA250 features RCA line level and banana jack speaker level inputs and outputs, automatic power-on that is triggered by any audio input signal, and a phase reverse switch to match the subwoofer to your room and your other speakers. Amplify UHF and VHF signals received by your outdoor TV antenna with the Titan 2 preamplifier. This high-gain, low-noise preamplifier solves common signal issues for strong, clear reception. Makes up for signal loss due to long cable lengths and splitters. 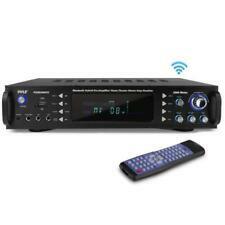 Mini HIFI digital Bluetooth audio power amplifier. 1 x Audio Amplifier. 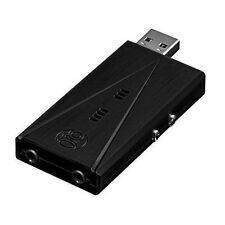 -SD Card, U disk, MP3 format play, support Bluetooth wireless connection. Bluetooth: Support. 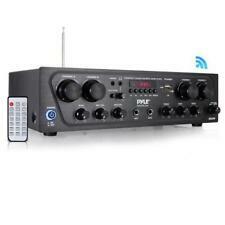 -Supports FM stereo radio. FM frequency: 87.5-108MHz. Technical Pro AX5000 2U Professional 2CH Power Amplifier. Item Code: AX5000. Dual 3 band equalizer. Repeat & random playback on USB & SD card inputs. Inputs: ¼", RCA, mp3 1/8", USB flash drive, SD Card. High Speed Digital Circuitry. What is the history of the item?. We test them and picture their current condition. What's included Bridging Synchronization. Type of Power Amplifier: AV power amplifier. 1 x Amplifier. Support: USB Disk/Max 64GB SD Card(Not included). Reverberation, fine tuning, balance, SD, USB interface. Bluetooth: Press until the word "BLUE" is displayed on the screen. 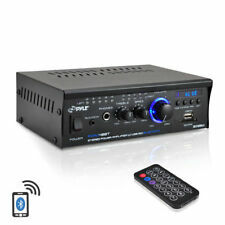 Mini HIFI digital bluetooth audio power amplifier. Support SD Card, U disk, MP3 format play, support bluetooth wireless connection. 1 x Audio Amplifier. Supports FM stereo radio. bluetooth: Support. Features: 2-Ch. Compact Stereo Amplifier System Bluetooth Wireless Audio Streaming Receiver FM Radio Tuner with Digital LCD Display Front Panel Button Control Center Audio Source Input Mode Selector Connect & Playback Audio from External Devices Headphone Jack with Independent Volume Control (2) 1/4'' Microphone Input Jacks Built-in Microphone Talk-Over Function (MIC1) MP3 Digital Audio File Support USB Flash Drive & SD Memory Card Readers USB Port Doubles as Device Charge Port Push-Type Speaker Connectors Aux (3. All-in-one amplifier with SD/MMC card and USB input. Our highly regarded technical support team has hands-on product experience and technical electronics knowledge. PRODUCT SUPPORT. No exceptions. Distinct burn odor and/or discolored/black spider around base of cone are characteristic of a burned voice coil. Here's everything you need to figure out which of the two ways to power a stereo system is right for your home set-up. Here are the general rules of thumb that buyers can use to navigate the pairing process between an amplifier and speakers. Whether you're setting up a home studio or want superior sound while listening to music, amplifiers and preamps can help you get the results you want. Preamps clean up and sometimes add detail to raw voice and digital music files. Amplifiers then increase sound volume and intensity, creating a richer, fuller audio experience. What kind of preamp do you need? As noise-cancelling devices, preamplifiers can provide a necessary step before amplification or other output. They take the initial audio signal, clean it up, and modulate it for you. Without preamps in place, you may wind up with feedback in your recording, lessening their quality. The type of equipment you need will depend largely on input type and desired results. Mic Preamps: Microphones tend to pick up considerable amounts of white noise, even in a quiet room. While recording voice, singers may breathe or sigh, creating distortion. Instrument microphones may pick up interference from neighbors. Mic preamps are designed to filter out these unwanted inputs for a cleaner signal. Color: Some options may add color, or modifications, similar to the acoustics that come from being in a small or large room. Integrated: Many amplifying devices come with integrated preamps designed to filter noise prior to amplification. 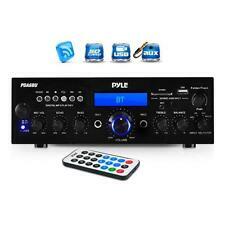 Models in this category include the Yamaha A-301 and the Marantz PM7005. Standalone: Designed to clean up sounds from a variety of input sources, preamps act as a buffer between source and output. This option is a good choice if you want to be able to swap equipment. What kind of amplifier do you need? Here, choices will depend largely on the number and type of outputs, because each one will need a different channel. Power Rating: In order to amplify speaker power, look for at least double the wattage of the speaker or output device. For example, 50-watt speakers need at least 100-watt amplification. The higher the wattage, the greater the amplification. Stereo: Because each side of stereo counts as a separate channel, you will need at least 2-channel amplification for stereo. Zoned Systems: Many home audio setups use separate zones where you can arrange for different areas to play different music and audio. In this situation, remember to consider each zone separately. Some zones may require multi-channel signal amplification for complex audio. Others may not need any at all. Home Recording Studios: If you're recording music or audio at home, consider a high-performance, multi-channel amp. This way, you can account for all vocal ranges, sound effects, and musical instruments.